I'm not a big fan of the shave ice things called snowballs. I just don't like the whole idea of the sticky, gooey, sugary syrup they put on top that's so sweet it will make your throat tickle. They are full of artificial coloring and flavoring. 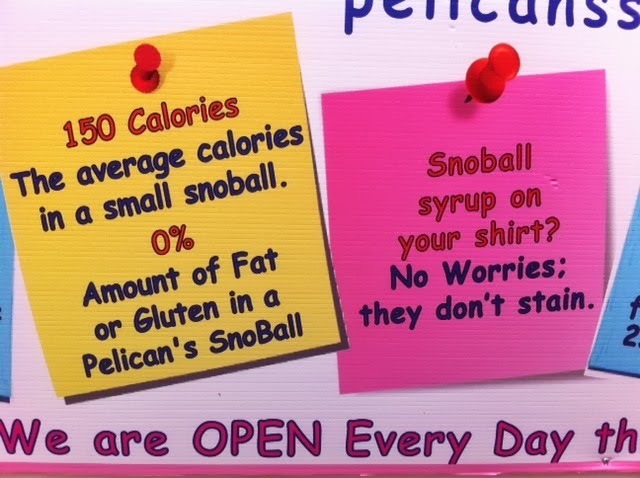 Any way, we now have a new place in town called Pelicans Snoballs. When my daughter saw this, she got excited and told me this was a big thing when she was in college and I should try it. So, this weekend, we decided to give it a try. I figured I could at least try it since they have over 100 flavors I was bound to find an interesting one. 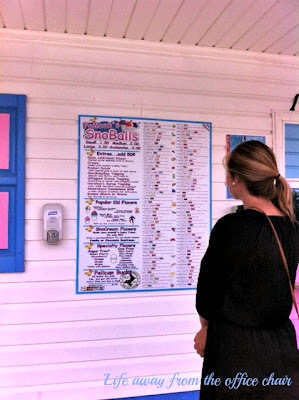 Ashley is studying hard to figure out the one she wants. 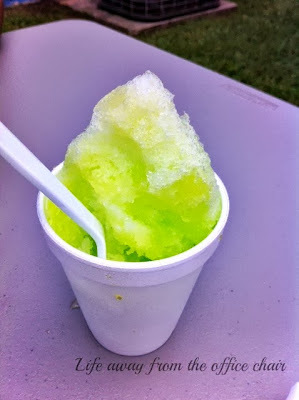 "Dill Pickle"-That's the flavor I picked. I even had them add extra pucker on top. I wanted to pick the craziest flavor they had. They even have "toothpaste" flavor but I'm sure that's just minty. It was a hard decision and I'm so indecisive possibilities were endless. 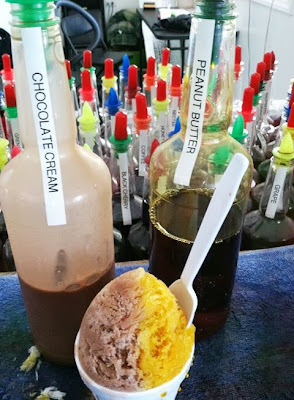 My Daughter chose one of the newest flavors,"Reese Cup" with extra chocolate drizzle. Ok, so this one does not look like the one in their picture. But she said it was really good. I just cant wrap my mind around the thought of any kind of chocolate on ice. eeesh. Ill leave that one on the hot cocoa or coffee side of things. 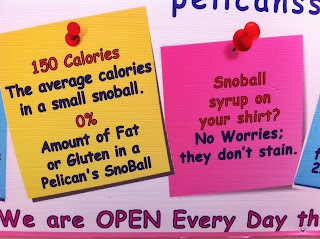 Here are a few interesting facts I seen posted on the building. I don't believe the "no stain one". Go check out the Menu. I may go back again just to try another kind. If you went here, what taste would you pick? You can even mix them up. They have some interesting flavors. My favorite snocone flavor is strawberry cheesecake with the sno creame. Yummy! I love that you tried dill pickle :) Snowcones are so refreshing when it's hot outside! We have been there several times. My daughter goes way too often. Lol. So far my favorite has been strawberry and banana. The fireball is exactly like a fireball candy. Sour apple is quite tasty. So far I haven't had a bad one!!!! 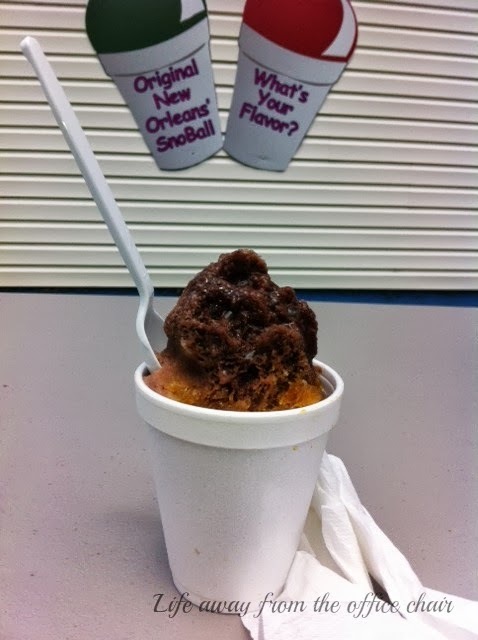 GOSH golly I haven't had a snowball in years. Last one I had was egg custard. Gosh you all are leaving some really tasty comments!